Light is called with various names such as infrared, visible, ultraviolet, vacuum-ultraviolet and X-ray, depending on its wavelength. 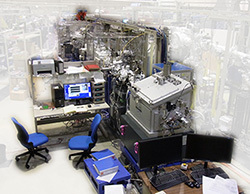 A synchrotron light source is capable of producing light in the ultra-wide wavelength range from infrared to X-rays. Synchrotron light radiated by high energy electrons traveling in a strong magnetic field is intense and highly collimated. It is widely used in various research fields including molecular science. 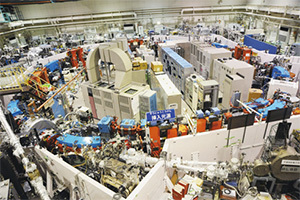 In IMS, a synchrotron light source has been operational since 1983. After several upgrades, it is still the brightest in the world among low energy synchrotron light sources. By utilizing its excellent performance, the electronic structure that is the origin of the functionalities of solids is directly observed. This facility is called UVSOR and is used by many researchers not only from our country but also from overseas.